You Are Here: Home > We Won’t Sell Any Vehicles Under Takata Recall! We Won’t Sell Any Vehicles Under Takata Recall! Believe it or not, there are millions and millions of vehicles on the road today that are equipped with faulty parts and components that could cause you endless inconvenience, injury, and even death. One example is the current Takata air bag recall that has impacted many different brands. Unfortunately, Florida state and federal regulations don’t make it illegal for a dealership to sell these faulty vehicles to consumers. 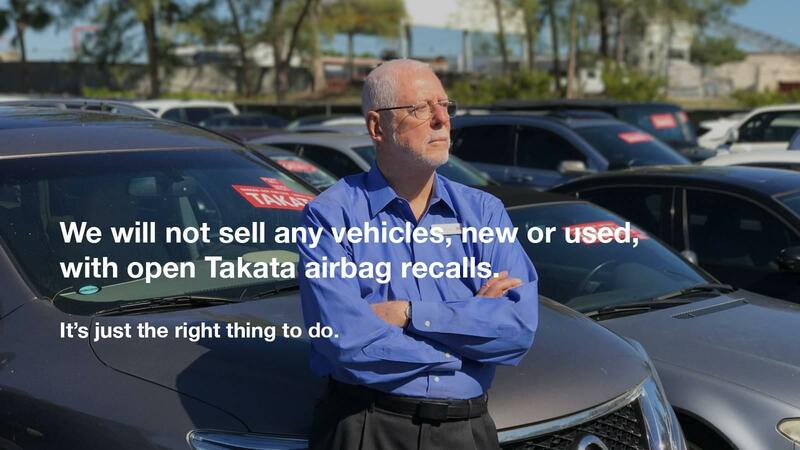 At Earl Stewart Toyota, we will never sell you a used car that is currently subject to the Takata recall. Find out more about this unethical but currently legal practice, and then find out what you and your friends and family can do to help make the sale of defective recall vehicles illegal in Florida. Is your car under recall right now? Click here to find out! Tell Governor Rick Scott to take action by signing the petition here. Today, there are millions upon millions of used cars on the roads that are equipped with parts that have been determined unsafe by the NHTSA and have been recalled. In fact, there are upwards of one hundred million vehicles on the road equipped with dangerously defective Takata airbags. Three out of four recalled vehicles will not end up being repaired. This means that when they end up on the lot of a car dealership for sale, they are being sold back to unsuspecting consumers with potentially deadly factors at play. We know that there are countless defective used cars being sold at car dealerships around the country, and as it turns out they are overwhelmingly deceptive about their practice of selling faulty vehicles. In a recent experiment, Earl Stewart mystery shopped and sent other mystery shoppers to 24 different dealerships throughout South Florida, and in all but one instance the sellers were dishonest about the recalled vehicles on their lot, even when asked specifically is there was an unfixed safety recall on the vehicle Mr. Stewart or his mystery shopper claimed to be interested in buying. Oftentimes, the only way we can effect change is through direct action. Please fill out this petition to encourage Governor Scott of Florida to make it illegal to sell used cars with open safety recalls. Please share this information through social media, with friends and family, and contact your local representatives and the Florida legislature to help raise awareness of his important issue in the automotive industry. And remember that you can purchase a reliable used car at Earl Stewart Toyota without having to worry about if it’s subject to a recall. We will never sell you a faulty vehicle. Please contact us if you have any further questions about our recall policy.